Lying just to the east of the Black Hills National Forest lies the picturesque community of Rapid City. Rapid City is often referred to as the “City of Presidents” thanks to its proximity to Mount Rushmore. 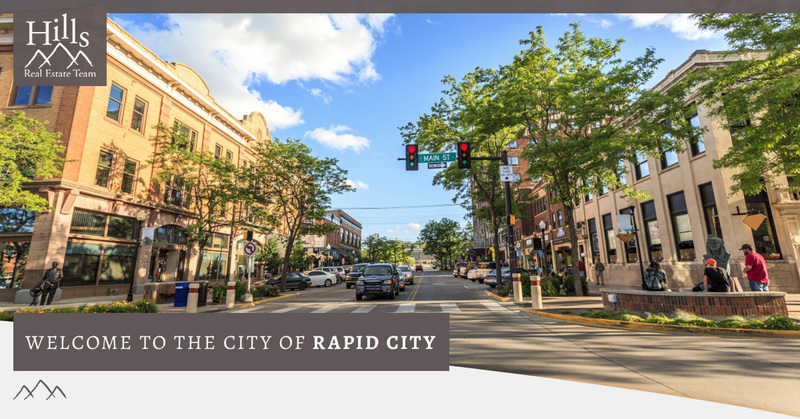 With its blend of cultural icons and natural landscapes and vistas, Rapid City is one of the most desirable places to live in South Dakota. The real estate agents at the Hills Real Estate Team want to help you find a beautiful new place to call home in Rapid City. Given that it is one of the largest cities in South Dakota, Rapid City offers excellent schooling choices for students and families. More than 14,000 students attend Rapid City’s 142 schools, taught by teachers who hold advanced degrees and have an average of 14 years of experience. In the southern part of Rapid City, you’ll find the University of South Dakota, the state’s flagship institution of higher education. With so many schooling options, it’s easy to see why families are moving to Rapid City in droves. Downtown Rapid City is truly where the community comes to life. Centrally located in the city, the district is filled with local businesses, dining, and attractions that you simply won’t find anywhere else. Get to know the city like the back of your hand and take a walking tour of Rapid City. You can enjoy spectacular works of art at the Dahl Center. Plus, you can enjoy community-focused events like Restaurant Week, the annual Cruiser Car Show & Street Fair, as well as holiday celebrations throughout the year. The recreational opportunities in Rapid City are meant to make the community a better place to work, live, and play. You’ll find recreational sports leagues for athletes of all ages and skill levels that make use of the extensive park system that runs throughout the city. For those looking to venture beyond the city, you can make an excursion into the Black Hills National Forest to enjoy endless miles of hiking trails and camping spots. A quick jaunt to the south brings you to the immense Wind Cave National Park where you can explore the subterranean cave network and marvel at the bison, elk, and other wildlife that roam the plains above. Rapid City is a rapidly growing city, meaning that there’s never been a better time to move there! Our real estate agents are lucky to be so familiar with Rapid City. As such, they can help you find your dream home in the area. You can start your search by reviewing our extensive property listings of homes for sale in Rapid City. As a Keller Williams real estate team, we’re always updating our listings, so make sure to check back often. If you’re excited to see some of these properties in person feel free to visit with us at one of our many open houses. Ready to buy a home, but don’t know where to start? You can review all of our buyer and seller information to find useful insights into mortgage rates, moving procedures, escrow, and much more. Find your dream home in Rapid City today with the help of the Hills Real Estate Agent. Contact us today to start your search and to meet with one of our friendly real estate agents!